I’m getting ready to take Putney (my dog, for those who haven’t met him) to Camp Clough (AKA my parents) for the summer. I’m leaving soon for 20 days, part of which is a liturgy conference at Yale. I’m expecting a house guest for two nights, immediately before departing. I haven’t had an overnight guest for months, and the guest room is the staging area for storing winter clothes and disposal of things I no longer need. Behind my piano is a pile of music: ten volumes of piano rags and French romantic chansons from the Chicago Public Library, a tote bag of choral octavos from Ellen Fisher, a borrowed collection of Schubert piano duets. Behind my couch is a basket of issues of Maine: the Magazine, Vermont Life, National Geographic, unread, awaiting reading. My refrigerator is packed full, most of its contents a large collection of sauces, relishes and other accompaniments I’ve picked up in stores trading in local and artisan foods. They keep well, but get used in exceedingly small quantities. On the kitchen shelves is a similar collection of unopened toppings. 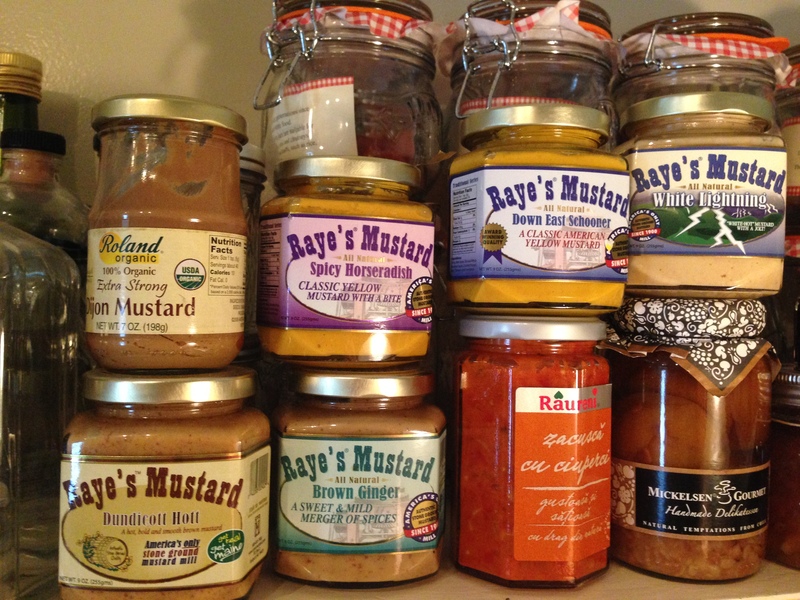 There are five jars of different kinds of mustard from Raye’s <www.rayesmustard.com> in Eastport, ME . One is open. Scattered about therein are more books and scores. I need to say right now that I am NOT a collector. In my twenties, I realized that the few collections I had collected for the sake of having collections brought me no joy. There was remorse for spending money on things that had no utility. I committed to no more collecting. No thimbles, no bone china plates of exotic places. Not that there’s anything wrong with it. In tidying for my guest’s arrival and my departure, I see the problem, arising from my being a curious person. Working with a life coach <www.purposeatwork.com> a few years ago, I articulated a life purpose that is, briefly, to guide others to uncover their own curiosity to lead them to discovery and learning. My life purpose grows out of my own attitude. I find meaning and joy in vacuuming up experiences, then letting them shape my perspective and choices. I thrive on exceptional sensory experiences. Five jars of mustard could tell you that (actually, there are seven jars, but only five from Raye’s) with a translator. The musical scores, the magazines, the Mason jars. These are containers for experiences. They gather around me, offering adventures. But they compete with each other for my time and energy, and my space. They conflict with my desire to simplify, to live more like the Shakers I visited a few summers ago. I am immensely blessed to know that curiosity will never, ever let me be bored in this too-short life. But it’s taking up a lotta space in my apartment!